Iran is exploiting the situation in Yemen, arming opponents of the internationally recognized government and using the country as a "test bed" for malign activities, a top Defense Department official told lawmakers today. The conflict, which began more than three years ago, threatens regional security and U.S. national security interests, which include the flow of commerce in the Red Sea, he said. With support from Iran, the Houthis – a Shia group trying to take control of Yemen – have launched more than 100 ballistic missiles and “countless” rockets into Saudi Arabia directed at major population centers, international airports, military installations and oil infrastructure, he said. In this month alone, he added, the Houthis have launched more than 13 ballistic missiles and long-range rockets into Saudi Arabia. 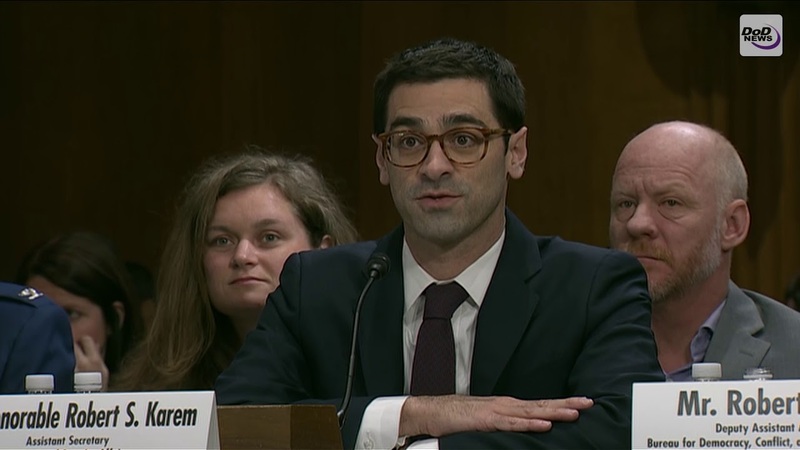 The Defense Department’s first line of effort and priority in Yemen is the fight against al-Qaida in the Arabian Peninsula and the Islamic State of Iraq and Syria in Yemen, Karem said. AQAP and ISIS in Yemen are “two terrorist organizations that directly threaten the United States, our allies and our partners,” he told the senators. U.S. forces are working in coordination with the U.N.-recognized government of Yemen to support regional counterterrorism partners, he said. AQAP and ISIS in Yemen are plotting from safe havens in Yemen against the American people and U.S. allies and partners, Karem said. U.S. military forces are conducting airstrikes against them in Yemen to disrupt and destroy terrorist networks, he said. "We need a stable, inclusive government in Yemen to provide security to the Yemeni people and to reduce and ultimately eliminate terrorist safe havens that are being used by al-Qaida in the Arabian Peninsula -- AQAP -- and ISIS in Yemen," Karem said. A second line of effort, he said, is to provide limited noncombat support to the Saudi-led coalition in support of the U.N.-recognized government of Yemen, he said. Fewer than 50 military personnel work in Saudi Araba with the Saudi-led coalition, advising and assisting with the defense of Saudi territory, sharing intelligence and providing logistical support, including aerial refueling, Karem said. 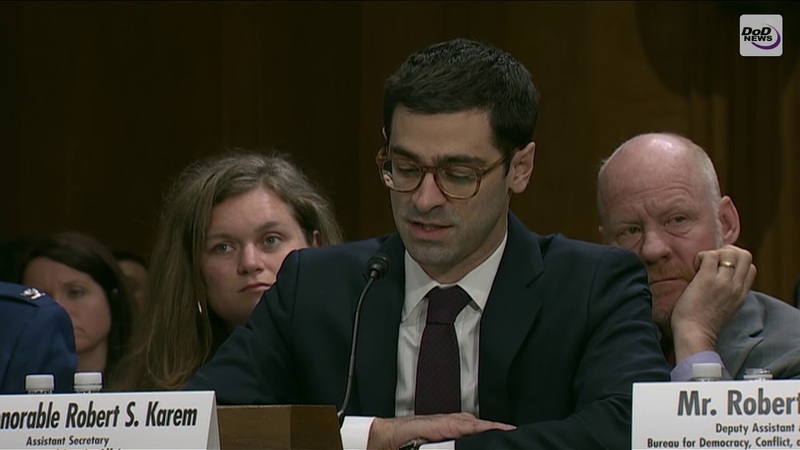 The conflict has had a devastating impact on the population, Karem and witnesses from the State Department and the U.S. Agency for International Development told the Senate panel. "Defeating ISIS in Yemen, al-Qaida in the Arabian Peninsula, countering Iran's malign activities in that region, and above all, reducing the extraordinary suffering and hardship for the Yemeni people -- all of these goals hinge on the resolution to the Yemeni conflict," David M. Satterfield, the State Department’s acting assistant secretary for Near Eastern affairs, said. Yemen is the single-largest humanitarian crisis in the world, with more than 75 percent of the country, or more than 22 million people, needing humanitarian assistance, said Robert Jenkins, deputy assistant administrator for USAID’s Bureau for Democracy, Conflict and Humanitarian Assistance. Further, the country is facing the world’s largest cholera outbreak, with more than 1 million suspected cases, he told senators.